As Ireland’s only corruption trial collapsed this week with a businessman and three implicated councillors cleared, Fintan O’Toole explains why an inquiry is needed into why a regime of impunity on corruption and fraud persists in the 26 County state. For the Irish Times. Last month Matthew Elderfield, the financial regulator widely respected for his role in restoring some credibility to the Irish banking system, did a highly unusual thing. He was giving evidence to the public accounts committee when, in a moment he had clearly thought about very carefully, he made what he called “a small digression”. This was, as he remarked, his last major public appearance before he leaves the job, so what he had to say was a final thought of some gravity. What he said, in his professionally understated way, was that Ireland needs a proper inquiry into the repeated failure of our legal system to prosecute criminals in high places. There is a sickness at the heart of official culture. It is not corruption - it is impunity. 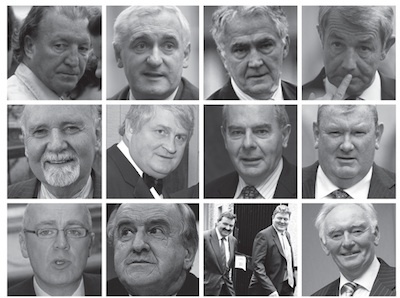 When you listen to the Anglo Irish tapes, what you hear is justified arrogance. You hear minds untroubled by the vaguest thought of criminal consequences. Our legal system has repeatedly proven itself utterly incapable of dealing with criminality in the business, institutional or political spheres. It still is. In the last few days alone we’ve had two stark examples. We learned that no bishops or priests are to be prosecuted for covering up and facilitating child abuse. And a UK House of Commons committee investigating the horse meat scandal expressed its concern that no prosecutions had resulted in Ireland or the UK. Freeza’s founder, Eamon Mackle, turned up in another meat scandal a long time ago. That scandal gave us clear warning of the utter inability of the Irish legal system to prosecute serious fraud. In 1991, Mackle submitted an affidavit to a Supreme Court hearing on an unrelated matter detailing some of his own activities in the meat trade: processing cattle that had been found to have tuberculosis; underweighing cattle to reduce the prices paid to farmers; switching cattle identification tags; the cross-Border smuggling of cattle and the bribing of Department of Agriculture officials. In 1986, Mackle was operating two deboning plants, in Waterford and Ballymun, as a subcontractor for the Goodman group. A thorough investigation by the Customs found that a large-scale fraud was being operated at both plants: the amounts of meat being placed in storage were systematically overdeclared to claim EU subsidies. Because all of this was investigated by the beef tribunal, it is one of the very rare cases where we know what happened in the subsequent criminal investigation. The Department of Agriculture concluded: “It is clear that a substantial fraud was committed in this case.” Yet it took an astonishing 13 months after it was discovered for the fraud to be referred to the Garda. It then took a month for a detective to be assigned to the case, and another month before the detective had a brief meeting with the department. It took yet another month for the detective to meet Customs; and a staggering 11 months for the detective to get a copy of the report. This inability to prosecute fraud ought to have set the alarms ringing. But nothing much changed and, even after the consequences of impunity have been brought home in the worst possible way, the current situation is little different. Matthew Elderfield was quite forthright in saying that the system consisting of his office, the Office of the Director of Corporate Enforcement and the Garda is inadequate in relation to “being able to ensure individual accountability” for financial offences. “White-collar crime seems to be an area in which the system is just not operating well in terms of being able to tackle that.” He called for “a stock-take, a report by the Law Reform Commission, a wise person’s report or something like that”. Actually what’s needed is a root-and-branch inquiry, preferably by a high-ranking international team, of the law, the Garda and the DPP’s office - the whole apparatus of justice - to answer two questions: why does impunity rule, and how are we going to end its reign?